Shannon & Andrew's Blog: Do You Bing? Andrew made me try out Microsoft's new search engine, Bing.com, and to my surprise I liked it. We were looking at our old house in Discovery Bay on zillow.com and I got excited when I saw the labyrinth we built in the backyard. 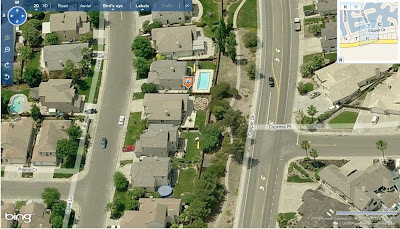 Microsoft's map allows you to see the house all the way around and not just from the street. I miss the labyrinth (not the hard clay soil) and now I can remember it always. All of the brick was recycled brick off of craigslist and Andrew and I spent hours chipping away mortar on 60% of them. Our house is the one below the house with the swimming pool (hi Stan and Sherry, we miss you). You can't really tell, but you can see the magnolia tree I planted in the front yard and the Sophora Japonica I planted in the backyard. P.S. Andrew reminded me that I didn't like the search engine, just the map feature. I stand corrected. Shannon, you are so creative - I love seeing all your projects. I wish you lived next door to show me in person and give me inspiration! Your trip looked wonderful - were you happy with your new camera? Oh....and I'm with Blake in the chop stick dept! sorry for the duplicate - I had some trouble setting up the google acct.